The United Nations is ready to check imports of construction material sent to Gaza in order to ease Israel's concerns that supplies could be used to rebuild Hamas tunnels, a UN envoy said Monday. UN Mideast envoy Robert Serry told the UN Security Council that reconstruction of Gaza remained the main priority once a durable ceasefire is agreed between Hamas and Israel. "Construction material must be allowed into Gaza to this effect - aggregate, bar and cement. 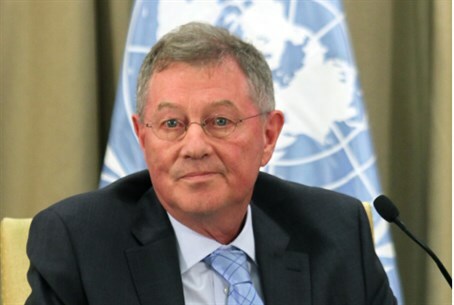 And their access to Gaza must be facilitated in such a way that fulfills Israel's security concerns," Serry said. "The United Nations stands ready to lend its support in this regard. Serry claimed some 16,800 housing units have been destroyed or severely damaged in the fighting that erupted on July 8, with the devastation three times worse than during the last Gaza conflict in 2008-2009. He voiced hope that UN monitoring could be agreed before a major donors conference announced by Norway takes place in Cairo to raise funds for reconstruction. Ample evidence has proven that Hamas uses UN and other aid money, as well as materials, to build terror tunnels to attack Israelis instead of providing municipal buildings to its own citizens. To illustrate this, the IDF revealed during the course of Operation Protective Edge last month that 4,680 trucks carrying 181 thousand tons of gravel, iron, cement, wood and other supplies have passed through the Kerem Shalom crossing into Gaza since January 2014 - much of it directly from Israel to fund civilian projects. Instead, however, a network of over 30 tunnels was found during the ground offensive - with each tunnel costing roughly $3 million to build. For every Hamas terror tunnel, the IDF stated, there was enough building materials to build 86 homes; seven mosques; six schools; or nineteen medical clinics. The statistics beg the question of why Hamas needs over ten times the building materials needed for the buildings above, as Gaza is not big enough to house an additional 190 medical clinics, for example.